This is what a world without retirement looks like. Workers will be unable to down tools, even when they can barely hold them with hands gnarled by age-related arthritis. The raising of the state retirement age will create a new social inequality. Those living in areas in which the average life expectancy is lower than the state retirement age (south-east England has the highest average life expectancy, Scotland the lowest) will subsidise those better off by dying before they can claim the pension they have contributed to throughout their lives. In other words, wealthier people become beneficiaries of what remains of the welfare state. Retirement is likely to be sustained in recognisable form in the short and medium term. Looming on the horizon, however, is a complete dismantling of this safety net. In 2014, the average age of the UK population exceeded 40 for the first time – up from 33.9 in 1974. In little more than a decade, half of the country’s population will be aged over 50. This will transform Britain – and it is no mere blip; the trend will continue as life expectancy increases. This year marked a demographic turning point in the UK. As the baby-boom generation (now aged between 53 and 71) entered retirement, for the first time since the early 1980s there were more people either too old or too young to work than there were of working age. The number of people in the UK aged 85 or more is expected to more than double in the next 25 years. By 2040, nearly one in seven Britons will be over 75. Half of all children born in the UK are predicted to live to 103. Some 10 million of us currently alive in the UK (and 130 million throughout Europe) are likely to live past the age of 100. The challenges are considerable. The tax imbalance that comes with an ageing population, whose tax contribution falls far short of their use of services, will rise to £15bn a year by 2060. Covering this gap will cost the equivalent of a 4p income tax rise for the working-age population. 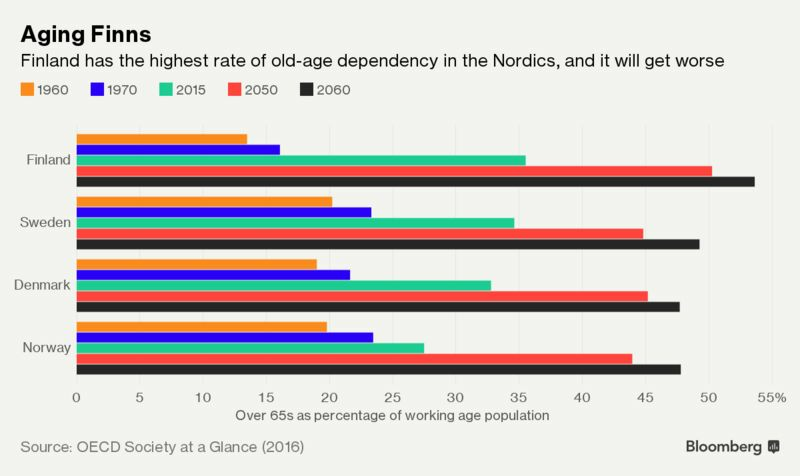 It is easy to see why governments might regard raising the state retirement age as a way to cover the cost of an ageing population. A successful pursuit of full employment of people into their late 60s could maintain the ratio of workers to non-workers for many decades to come. And were the employment rate for older workers to match that of the 30-40 age group, the additional tax payments could be as much as £88.4bn. According to PwC’s Golden Age Index, had our employment rates for those aged 55 years and older been as high as those in Sweden between 2003 and 2013, UK national GDP would have been £105bn – or 5.8% – higher. There are, of course, problems to this approach. Those who can happily work into their 70s and beyond are likely to be the privileged few: the highly educated elite who haven’t spent their working lives in jobs that negatively affect their health. If the state pension age is pushed further away, for those with failing health, family responsibilities or no jobs, life will become very difficult. Retirement is an ancient concept. It caused one of the worst military disasters ever faced by the Roman empire when, in AD14, the imperial power increased the retirement age and decreased the pensions of its legionaries, causing mutiny in Pannonia and Germany. The ringleaders were rounded up and disposed of, but the institution remains so highly prized that any threat to its continued existence is liable to cause mutiny. “Retirement has been stolen. You can pay in as much as you like. They will never pay back. Time for a grey revolution,” one reader emailed. It was in 1881 that the German chancellor, Otto von Bismarck, made a radical speech to the Reichstag, calling for government-run financial support for those aged over 70 who were “disabled from work by age and invalidity”. The scheme wasn’t the socialist ideal it is sometimes assumed to be: Bismarck was actually advocating a disability pension, not a retirement pension as we understand it today. Besides, the retirement age he recommended just about aligned with average life expectancy in Germany at that time. Bismarck did, however, have a further vision that was genuinely too radical for his era: he proposed a pension that could be drawn at any age, if the contributor was judged unfit for work. Those drawing it earlier would receive a lower amount. In 2006, it became legal for employers to force their workers to retire at the age of 65. A campaign led by Age Concern and Help the Aged was swift and effective in its argument that the new default retirement age law broke EU rules and gave employers too much leeway to justify direct discrimination on the grounds of age. On 1 October 2011, the law was overturned. Since then, Britain’s workforce has greyed almost before our eyes: in the last 15 years, the number of working people aged 50-64 has increased by 60% to 8 million (far greater than the increase in the population of people over 50). The proportion of people aged 70-74 in employment, meanwhile, has almost doubled in the past 10 years. This trend will continue. By 2020, one-third of the workforce will be over 50. The proportional increase may be substantial, but it charts growth from a low level. In empirical terms, the impact is less positive: almost one-third of people in the UK aged 50-64 are not working. In fact, a greater number are becoming jobless than finding employment: almost 40% of employment and support allowance claimants are over 50, an indication that many older people are unable to easily find new and sustainable work. This is unsustainable: by 2020, an estimated 12.5m jobs will become vacant as a result of older people leaving the workforce. Yet there will only be 7 million younger people to fill them. If we can no longer rely on immigration to fill the gaps, employers will have to shed their prejudices, workplaces will have to be adapted, and social services will have to step in to provide the care that ageing people can no longer give their grandchildren, ageing spouses or parents if they remain in the workforce. South Korea is aging fast, with the elderly expected to account for more than 40 percent of the total population by 2060 according to Statistics Korea. Moon Jae-in, the newly elected president, has promised to tackle this trend by increasing the birthrate and securing a better livelihood for the elderly. The dire situation facing Korea's elderly has been well reported by the media _ images of them collecting cardboard and paper on the streets, for example, received global attention. Statistics still back this image, with almost half of the elderly living in poverty. A remedy proposed by all presidential candidates in the election could be increases in the basic pension. Moon proposed that the elderly in the bottom 70 percent of the income ladder will receive a monthly allowance of 300,000 won ($265). To stimulate marriage and birth, which has long been declining, he promised to create a work environment more conducive to parenting and better infrastructure for childcare. His policies include increasing paid parental leave benefits from 40 percent to 80 percent of income, providing a monthly childcare allowance of 100,000 won for every child under five, and expanding public kindergartens and preschools. Many still raise concerns as to whether Moon will live up to his promises. His budget proposal has drawn constant criticism for failing to lay out adequate funds and ways to collect them. NEW DELHI: India will transform gradually from young to a 'greying' country and by 2050 every 5th Indian will be in 60s as against every 12th at present. Flagging the demographic transition, a PFRDA-CRISIL report today said it is important that the development of the under-penetrated pension market in India be initiated now, when the situation is ripe. "Demographically, India will transition slowly from a 'young' to a 'greying' country, where persons above the age .. The U.S. fertility rate just hit a historic low. Why some demographers are freaking out. According to provisional 2016 population data released by the Centers for Disease Control and Prevention on Friday, the number of births fell 1 percent from a year earlier, bringing the general fertility rate to 62.0 births per 1,000 women ages 15 to 44. The trend is being driven by a decline in birthrates for teens and 20-somethings. The birthrate for women in their 30s and 40s increased — but not enough to make up for the lower numbers in their younger peers. A country's birthrate is among the most important measures of demographic health. The number needs to be within a certain range, called the “replacement level,” to keep a population stable so that it neither grows nor shrinks. If too low, there's a danger that we wouldn't be able to replace the aging workforce and have enough tax revenue to keep the economy stable. Countries such as France and Japan that have low birthrates have put pro-family policies into place to try to encourage couples to have babies. The flip side can also be a problem. Birthrates that are too high can strain resources such as clean water, food, shelter and social services, problems faced by India, where the fertility rate has fallen over the past few decades but still remains high. Those supposedly entitled young adults with fragile egos who live in their parents' basements and hop from job-to-job — it turns out they're also much less likely to have babies, at least so far. Some experts think millennials are just postponing parenthood while others fear they're choosing not to have children at all. Strobino is among those who is optimistic and sees hope in the data. She points out that the fall in birthrates in teens — an age when many pregnancies tend to be unplanned — is something we want and that the highest birthrates are now among women 25 to 34 years of age. “What this is is a trend of women becoming more educated and more mature. I’m not sure that’s bad,” she explained. Idaho’s 65 and over population is booming. That’s going to cost us all more, but pay us more, too. Idaho’s population continues to grow and age faster than the rest of the country, and that has big implications for wages, jobs and the state economy, as Baby Boomers bump up into retirement age and, seemingly, stream into the Gem State. The latest data from mid-2016 shows that more than half of the nearly 116,000 Idahoans added since the 2010 census are over 65. They represent 52 percent of the total. The 25-44 cohort was the next largest contingent, at a little over 23 percent of the total; 45- to 64-year-olds were 15.6 percent. At the low end, agewise and otherwise, the under-18 group made up 7 percent of the overall increase, while the 18-to-24 group accounted for less than 2 percent of new residents. Measuring growth within those brackets, the 65-and-over set again led, their numbers increasing by nearly one-third between the 2010 census and the mid-2016 estimate, from 195,000 to 255,000. That includes a 12.6 percent increase in those 85 or older. The growth rate for 18-and-unders was just below 2 percent, with the 18-to-24 population again smallest, growing at a 1.4 percent rate. In the six years following the 2010 census, Idaho’s overall population grew by 7.4 percent, compared to 4.7 percent for the entire U.S. Idaho’s 31 percent increase in the 65-and-over group during the period compares to about 22 percent for the U.S as a whole. Still, even with the uptick in Idaho’s median age that influx caused, to just over 36 years, that was below the overall U.S. median of just below 38 years. OK, so that’s wages. What about prices? Older people who come to Idaho might be drawn by family ties, the climate and scenery, and the relatively low cost of living, but they come with cash at the ready. They’re willing and able to pay a little more to scoop up that house in the Boise Foothills or close by McCall or Ketchum. High Boise home demand and the resulting spike in prices partly bears this out. The liquidity those newcomers bring with them bears on other sectors of the economy. Since they are typically wealthier, they’ll pay more for food and other products and staples, and they’re used to higher prices where they used to live. Their numbers alone boost demand, so prices will go up, even if more suppliers arrive to meet the need. From an economist’s point of view, it’s not a bad thing — unless something happens to throw things out of the tidy equilibrium that looks appealing in economics textbooks. More on that below. So what’s ahead for Idaho’s business sectors? Heightened demand for services of all kinds — from lawn care to health care, outdoor recreation to home renovation — and Idaho is seeing that already. Health care providers across the board are in higher demand to meet the needs of the aging population, and that will be a persistent trend. Will the health needs of older newcomers overburden rural communities somehow? Probably not, said Dalton: People who relocate to remote areas do so by choice and presumably know what they’re getting themselves into. For those at entry level or early career stage of the workforce, if Idaho figures out how to meet its goals to improve and expand higher education — not just four-year college, but vocational, technical and two-year programs — that success will answer the shortage of qualified workers that plagues employers now. So if it’s all to the good, what could mess it up? Depends on whom you ask. If you’re a longtime resident who doesn’t like the changes, don’t ask an economist. From their perspective, what tends to muddle the orderly balance of supply and demand must often are policy attempts to control it and intervene. Let’s say a locality, facing an influx of new residents and concerned with the changes that brings, throws up barriers to new construction, for example, or enacts policies to protect existing businesses or industries at the expense of others. That doesn’t stop the underlying growth trend, but it does make the ripple effects of that growth more pronounced, such as by driving costs for housing and goods higher. That in turn more adversely affects those less well-off, longer-term residents who are the intended beneficiaries of those policies. A resident of Boise since 1958, when parts of the Boise Bench were still farmland, Dalton said all the growth has been good for Boise and for Idaho. “Instead of people thinking about an influx of (newcomers) as a problem, they should be thinking about an influx of diversity and bringing in more opportunities,” he said. Any way you measure them, Japan’s population figures are dire. The country is expected to lose more than one-third of its population by 2060, thanks largely to low birth rates and an aging populace. In 2012, according to Japan’s Statistical Yearbook, the country’s annual death-to-population ratio passed one percent. This isn’t astoundingly high: the U.S. Central Intelligence Agency’s World Factbook ranks Japan’s death rate (the deaths during a year per 1,000 population) at 54th out of 225 countries. But the trouble comes when you factor in the fertility rate: Japan currently has the third-lowest recorded birth rate in the world. All of this has already had a profound effect on Japanese housing. Between the mid-1990s and 2013, the number of vacant or abandoned properties in Japan doubled. These neglected structures now make up an estimated 13.5 percent of the country’s housing stock. The phenomenon of abandoned Japanese homes is so widespread that people have begun writing poetry about it. When the Tokyo Association of Housing and Land Investigators put out a call for satirical haikus on the topic, it received 4,000 responses. “Where we were born, vacant houses gather, for legacy’s sake,” read one. "Watch out! Earthquakes and Thunder! Burning Vacant Homes,” read another. It’s as though the entire country is facing a U.S. Rust Belt-style population problem. “Tokyo could end up being surrounded by Detroits,” one Japanese real estate expert told The New York Times in August. And like some Rust Belt cities, Japan has taken to dealing with it through legislation. Passed in May 2015, Japan’s newest Vacant Housing Law is similar to moves in some shrinking U.S. cities that give government more latitude to enforce code violations and tear down structures that have become blighted and potentially dangerous. But the Japanese law’s real innovation, according to Peter Manda, a New Jersey-based fraud investigator with EY (formerly Ernst & Young) who’s working toward an advanced international law degree at Boston University, is its focus on creating a database that not only identifies vacant properties and their owners, but also helps bring those properties into public use. Here’s how it works: In Japan, local municipalities are authorized by the country’s national government to create councils that keep track of properties showing signs of possible abandonment. Those councils then report vacant properties to national tax authorities, who hand over ownership data and log the information into a national database. That database tracks where the vacant properties are located, and whether any progress has been made to remediate. If no progress is made after the councils notify owners what needs to be done, fines are levied. If the owners are unable to remediate—or they can’t be located at all—the councils then have the right to demolish or refurbish the properties as long as that use is approved by the national government for, as Manda puts it, “cultural, social, or governmental purposes that are predefined in an approved smart growth-oriented response plan.” In addition to fines, a national tax funds the whole process. of the next 45 years. Enacted in 1979 by China’s Communist Party, the controversial “One Child Policy” was primarily meant to slow the country’s rapid population growth, while capping the growing drain on China’s limited resources. Even though the government’s primary objectives were arguably achieved through these extreme measures, it has been at an extraordinary human cost. The draconian enforcement of these policies, combined with the unintended consequences on families and the cultural preference for male children, will have an everlasting impact on the country’s future. Fast forward to today, and the policy is still in place, but to a lesser effect. Since early 2016, families have been allowed to have two children – but even with this change in place, China still has a self-inflicted demographic disaster on its hands. In the below population pyramids created by Aron Strandberg, the very different trajectories of China and India are compared directly. 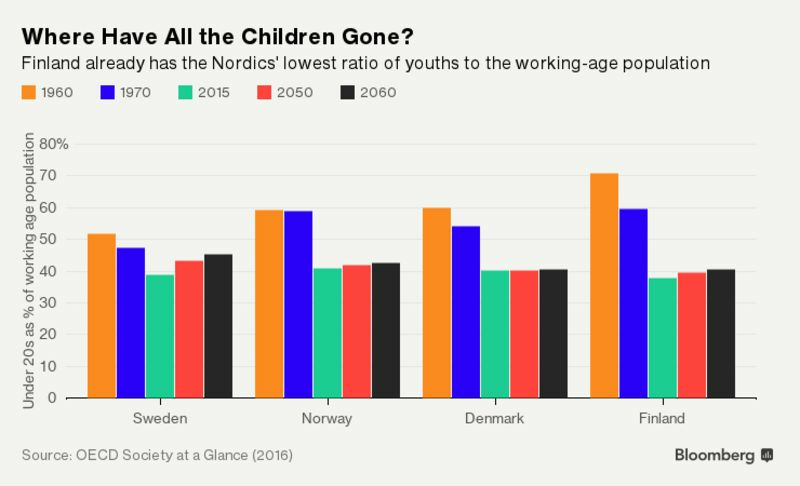 China is not only skewing older and more male – it is also losing its strong base of younger workers that could potentially support the rest of the population. China’s “population pyramid” is not really a pyramid at all – in the coming decades, it’ll look more like a single pillar stuck propping up a burgeoning elderly demographic of people born before 1979. And over time, the unintended and ongoing effects of population control will be extremely impactful on China’s future. As one example of the emerging challenges, a recent estimate published in Scientific American pegged China’s shortage of women at 62 million, creating a situation where there’ll be millions of men who are unable to marry. I hate the word "utilize" and I despise the word "impactful". UGH. Last edited by campbell; 08-31-2017 at 11:19 AM..
As China struggles with a declining population and a lack of young people, India is expected to takes its place as the most populous country in the world by roughly 2027. Perhaps nothing illustrates those better than Finland's famous baby-boxes. Introduced in 1937, containers full of baby clothes and care products are delivered to expectant mothers, with the cardboard boxes doubling up as a makeshift cot. The idea behind the maternity packages was prompted by concerns over high infant mortality rates in low-income families. The starter kits were eventually extended to all families. Reversing the modern idea that it's ok not to have kids is impracticable. Opening the doors to immigrants is a political no-go area (Prime Minister Juha Sipila's center-right government relies on the support of nationalist lawmakers). The leader of the opposition Social Democrats, Antti Rinne, caused a stir in August when he urged women to fulfill their patriotic duty and have more babies. Schauman believes that won't be enough.